Allied losses in dead and PoWs were far worse, in proportion, than Dunkirk. The losses at sea also exceeded the losses at Dunkirk, many boats being sunk fully loaded with evacuated troops. There were Army photographers and others who filmed Dunkirk. 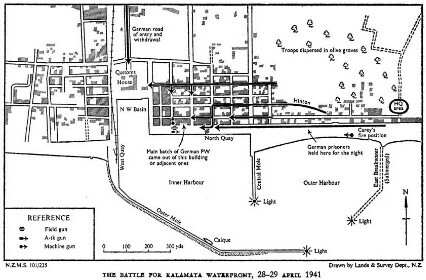 There was no media at Kalamata, and the defeat and surrender were hidden most effectively for 50 years. Over 10,000 were left on the beaches. One of the lasting tragedies of the 1941 Greek Campaign is that people did not know of it and still do not. It was swept under the carpet and never exposed to public view. Many veterans have tried, and continue to try, to bring people’s attention to the campaign through their various books, hoping that when they are gone, as they soon all will be, what they did had not been in vain. The veterans felt it especially important that the Greek Campaign and the Battle of Kalamata should not be forgotten. This is why the Annual Service of Commemoration in Kalamata is so important and why the service in 2016 – 75 years after the event – will be even more poignant as so few of the original veterans will be with us. 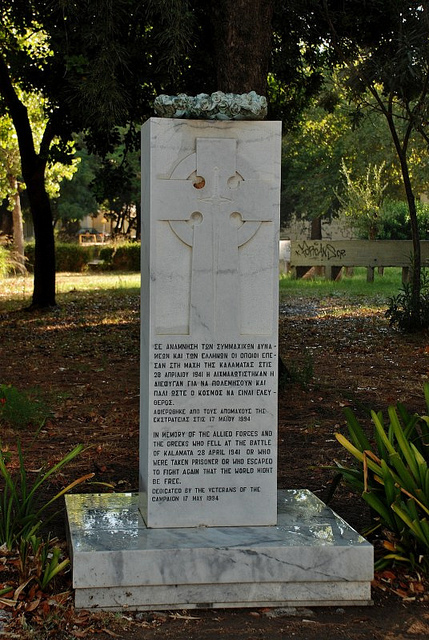 Edwin, with the support of veterans and many others, was instrumental in getting a permanent memorial erected in Kalamata, at the southern end of the railway park – from where, in April 1941, the trucks left loaded with PoWs. The memorial was unveiled in 1994 and an annual Service of Commemoration has been held in May at the site ever since. The Mayor and City Council of Kalamata always make us extremely welcome and are great supporters who have promised to uphold this tradition in perpetuity. We have been delighted, and honoured, to receive representatives from various embassies at previous ceremonies, including Brigadier Stephen Saunders in May 2000 – which must have been one of his last such engagements before his tragic and untimely death just a few weeks later. Colonel Tony Morphet and other dignitaries attended our 2011 70th anniversary service. Edwin was made an honorary citizen of Kalamata, along with Sir Patrick (Paddy) Leigh-Fermor, at which time they were both also granted the Freedom of the City of Kalamata.